So where do I start? Well, I grew up in London in the Seventies and was lucky enough to have grown up listening to T-Rex, David Bowie, Roxy Music, Thin Lizzy, Slade etc. I started going to see bands playing live at the age of 12 and got to see the Clash, the Damned, the Ramones and pretty much all of the great early punk bands. That was what inspired me to buy a guitar, learn the requisite three chords and start a band. A succession of terrible punk bands followed until I found myself living in Berlin in 1984. The Berlin Wall was still up and the population of Germany either faced two years mandatory military service or the move to Berlin where the bars never closed. Not surprisingly Berlin was a lot of fun in those days as it was full of artists musicians and people who didn't want to join the German army. I ended up playing guitar in another band that landed some opening slots for bands like My Bloody Valentine and Sonic Youth. It was while I was living in Berlin that I became serious about recording. 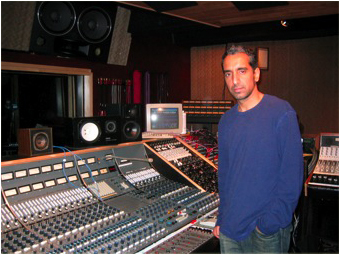 A couple of years later I moved to New York City and got a job working at Chung King Recording Studio where I got to engineer records for the likes of Run DMC, Onyx, Brand Nubians, Wu Tang Clan and a few hundred other Hip Hop artists. After spending years replaying bass and guitar lines for songs where the artist had wanted to use a sample that the original writer wouldn't clear, I found myself bored and wanted to get back to rock. Enter noted Rock Producer Michael Beinhorn who hired me to engineer Social Distortion's 'White Light, White Heat, White Trash'. From that I went on to Engineer for David Kahne working on two Sugar Ray records as well as getting to engineer and/or mix tracks for Chris Isaak, No Doubt and various others. Then I got a call from Atlantic records about a production gig for an unsigned artist called Kid Rock. He didn't stay unsigned for long as Atlantic signed him the day that we delivered the first two songs. That record went on to sell 11 million records in the U.S alone. So that is the past. The present has me based in Los Angeles where I've been since 1998 and the future has me hoping to produce the next group that will have the same impact on the world that the Clash did on my life.